These are my friends Dan and Brian. 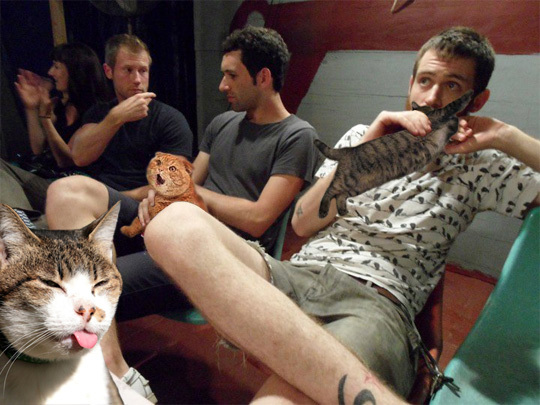 Even though he has a Boozecat, Dan doesn't look too happy. This is because both the wheels were stolen off his bike last night. Don't you hate thieves? They were stolen on a very busy street in front of a very busy movie theater. There had to have been at least a dozen people who watched as the wheels were stolen. So please, if you see someone taking wheels off a bike that is locked up, DO SOMETHING. At least say, "Hey man, that's my bike!" That would probably scare them off. Or call a cop. Or call Garfield.